If I told you that there are 600,000 manufacturing jobs going begging in this country would you believe me? Well it appears there are. And the reason there are is a mismatch between the skills required for the jobs and the skills of the people who have been applying for the jobs. This problem was described in a recent article in the Washington Post. This article has prompted a storm of comments at the Post. There was also a great article on this issue in the Atlantic that I discussed a few weeks back. But the answer to this problem is already at hand: our nation’s community colleges. 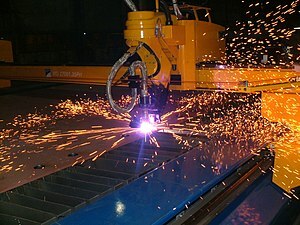 New factory workers have to be trained to operate computer numerically controlled (CNC) machines. Many community colleges offer classes in CNC machine operations, culminating in an associate’s degree in machine tool technology. The Post article also discussed another familiar issue preventing a better match of young workers with meaningful employment: our nation’s fixation on the pipe dream that every American will graduate from a four year college. This despite the fact that lots of college graduates with sociology degrees are working at Home Depot while many graduates from two-year community college programs are working in the field they were trained for and are making $28 an hour. I think this over emphasis on getting a college degree stems from the fact that many people in this country still think that what you do during the day governs what you do in your spare time. You know the myth: professionals finish up at the office then skip off to the opera and book groups while factory workers grab a six-pack on the way home and then watch three hours of New Jersey Housewives. All I know is that while I am a lawyer, I haven’t been to an opera in three decades and I love New Jersey Housewives. Vocational AA degrees need to be promoted just as vigorously by high school counselors as BAs in Political Science. Only then can our country’s manufacturing skill mismatch be addressed. This entry was posted in american made, Education, Made in America, made in usa and tagged CNC, Community college, vocational training, Washington Post. Bookmark the permalink.